Condensation polymers are formed by condensation of diamine or diols with dicarboxylic acids. a) What is the structure of nylon-6, made by alkaline polymerisation of caprolactom? b)  Suggest a mechanism for the process. 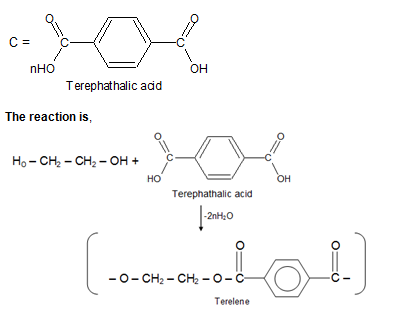 Is polymerisation of the chain reaction or step reaction type? 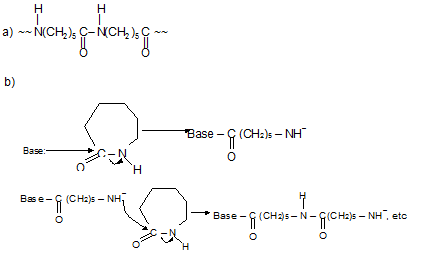 The reaction is anionic chain reaction polymerization, involving nucleophilic substitution at the acyl group of the cyclic amide. The base could be OH– itself or the anion formed by abstraction of the –NH proton from a molecule of lactam.